Local investors took a hammering yesterday after steep sell-offs on Wall Street sparked by concerns over global growth sent regional shares tumbling. The souring mood sent Asian markets tumbling, with the Shanghai Composite losing 0.82 per cent and Hong Kong's Hang Seng Index shedding 1.05 per cent. Japan's Nikkei 225 fell 1.82 per cent while South Korea's Kospi edged down 0.43 per cent. 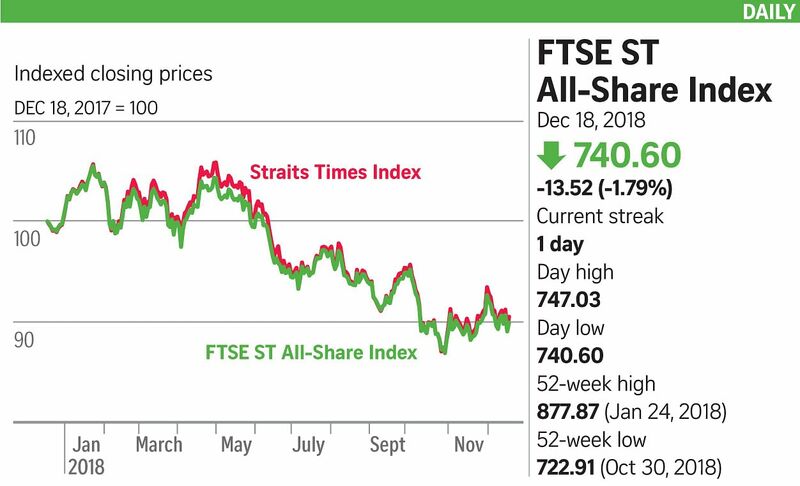 The bloodletting was more pronounced here with the Straits Times Index slumping throughout the day. It erased all of Monday's gains in closing down 2.2 per cent or 68.71 points to 3,045.54. About 1.14 billion shares worth $1.05 billion changed hands with losers beating gainers 285 to 131. All three banks finished firmly in the red. DBS lost 1.63 per cent to $23.55, UOB closed 2.49 per cent lower at $24.30 while OCBC fell 1.68 per cent to $11.15. Singtel was among the most active, losing 3.27 per cent at $2.96 with 28.5 million shares traded. Genting Singapore declined 1.5 per cent to 98.5 cents on trade of 26.4 million. The stock has shed about a quarter of its value since it began the year at $1.32. But KGI Securities believes it can still pay attractive dividends while offering limited downside risk. It noted that Genting's price earnings and price-to-book valuations are below the 10-year average. Data pointing to slowing manufacturing and declining home-builder sentiment overnight sent US equity indexes tumbling. "Let last night's US economic data be a stark reminder the economy is not immune to a slowdown," said Mr Stephen Innes, head of Apac trading at Oanda. "We had a great inclination for the rest of the world's economic woes but, if the US economy turns south, we're in for a world of hurt. After all, it was the US market that was carrying the weight of global risk sentiment on its shoulder." Investors also looked to Chinese President Xi Jinping's speech yesterday to calm risk sentiment. Mr Xi called for his country to "stay the course" on reform and stressed that "no one is in a position to dictate to the Chinese people what should or should not be done". Unfortunately, investors were left wanting more. Mr Innes said: "Without question, he disappointed markets, but the bar was always high for a huge surprise." Investors now await the US Federal Reserve's monetary policy decision today, with expectations for another rate rise.